Mobile pet grooming is a companion animal service sector that is rapidly growing for a host of reasons. As people lead very hectic lives and there are more older pet owners than ever who are less mobile themselves, more folks now seek convenience and ease in caring for their pets. This is also potentially a better option for pets that get stressed when traveling by car, are anxious or aggressive in the presence of other pets, or are elderly and less able to get around. Even better, a pet doesn’t have to sit in a cage for hours; they are in and out, as they are serviced right at the clients’ doorsteps. Among the advantages of owning a mobile grooming business as opposed to operating out of a brick-and-mortar location is that you don’t have to pay rent or property taxes or utility costs. Your hours are more flexible. You can justify charging more for your services, and your vehicle can be a virtual rolling advertisement for your business. Get experience. Before launching any type of business, it’s best to actually work in the industry and acquire enough experience and training to build your skills and confidence. You can go about this in a number of ways, from apprenticeships with established groomers to working for another groomer and/or formal training that leads to certification. This process gives you several advantages: You already understand the pros, cons, challenges, and opportunities that are part of the industry; you have contacts and support among people in the industry; you start your business with a strong positive reputation and credentials (especially if you choose to earn a certification). Determine mobile pet grooming business licensing and insurance requirements. First, find out what kind of business licenses, permits, and insurance you need for your particular region. Check with your city, town, or county government offices to learn what is required. Another good resource is the local chamber of commerce. In addition to specific liability and other required insurance, you have to consider vehicle insurance. If you can, consult with a business attorney before launching any endeavor. Determine the cost of the equipment you will need. 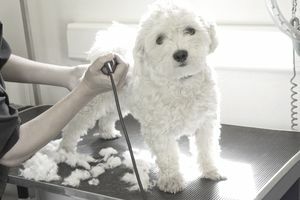 Becoming a mobile pet groomer can be pricey. In fact, once you look at the costs, you may decide to wait until you have more money in the bank. A vehicle: Depending on what kind of startup capital you have, a mobile grooming vehicle can range in price from $10,000 to $100,000. Lower-priced options include vans and hitch-on trailers, the latter of which are less expensive. If you have the money, you can also purchase an already fully equipped and outfitted pet grooming van. If you decide to go the latter route, one company to consider is Wagn'Tails, a market leader based in Granger, Indiana. This company, which has clients in 43 states, provides business consulting services for those who wish to enter the mobile grooming industry. A mobile grooming vehicle must have proper flooring and ventilation and be kept sparkling clean and sanitary at all times. All waste must be disposed of in compliance with municipal and environmental ordinances and regulations. Like any motor vehicle, your grooming operation will require ongoing general maintenance, such as regular oil changes, proper tire inflation, and other forms of preventative upkeep. Inclement weather is always a possibility, so you need to prepare your vehicle accordingly, as an out-of-service vehicle can grind your operation to a halt. Sources of funding: Where will you find capital (money to invest in equipment) before you even start your business? Some common funding sources include savings, family loans, bank loans, and credit cards (though credit cards should be last on your list). Expenditures: What will it cost you to get up and running with the equipment and licenses you need? What will your weekly costs be for equipment, supplies, gas, etc.? What will you budget for advertising and promotion? What are the costs of insurance for yourself and your vehicle? Income: What will you be able to charge for your work? Based on that information, you can make an educated guess about how much you'll be able to earn as you get started and then build your business. Luckily, pet groomers get lots of repeat business, so once you have customers who like your work, you should have a stable income. Be sure to choose a catchy business name and logo, which should be displayed largely, colorfully, and prominently on your vehicle. Your vehicle is a virtual rolling advertisement for your business, which puts you at an advantage. Don't forget to use both conventional and currently popular ways of advertising and promoting your business through print ads in local community publications, social media, and internet business listing sites. Of course, you absolutely should have a professional-looking website. If you follow these tips, you should be on the road to success in no time, as mobile pet grooming is a sector that is still growing.